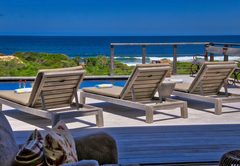 Beachscape is a highly recommended property providing self catering in Keurboomstrand for up to 10 guests visiting the Garden Route region. 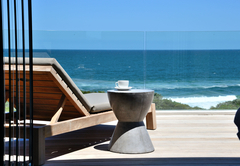 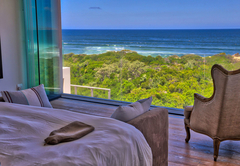 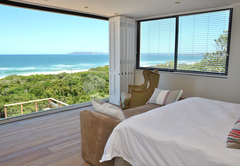 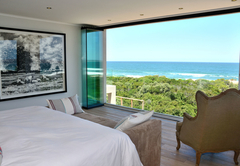 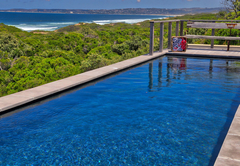 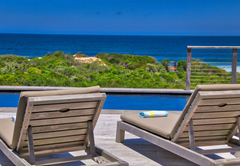 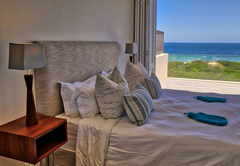 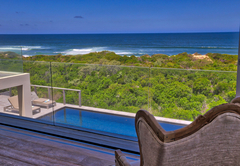 Beachscape enjoys a stunning location on the renowned Keurboomstrand, 5km east of Plettenberg Bay. 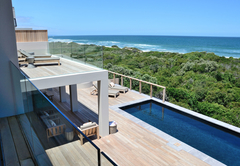 Less than 100m from the pristine sandy beach and dunes, this ultra-modern property enjoys uninterrupted sea views with endless opportunities for dolphin and whale watching. 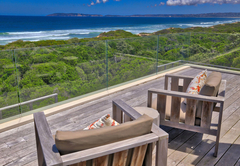 The famous Robberg Peninsula and the ever-popular coastal town of Plett can been seen in the distance. 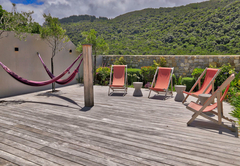 Secure entrance and adjacent private north facing courtyard laid with exotic wooden decking and comfortably furnished. 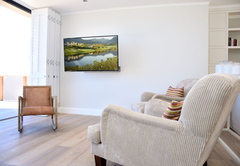 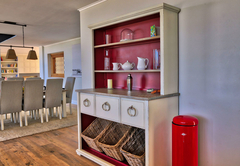 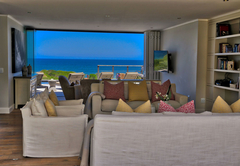 The ground floor includes a large, beautifully appointed kitchen with stunning views across the beach and coastline, a scullery, dining area (with log burning stove) opening onto an exterior entertainment space with full braai. 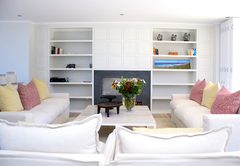 The ground floor also features a large open plan library / relaxation area and TV lounge, an entrance hall with cloakroom and steps down to a large double garage. 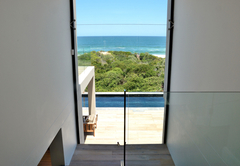 All ground floor areas have fold and stack doors offering free-flow access to the decks, pool and entertainment areas. 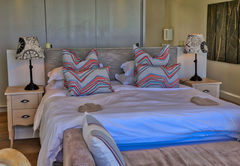 There are four bedrooms on the 1st floor: a very spacious master bedroom with king size bed, dressing area and en-suite shower and bathroom. 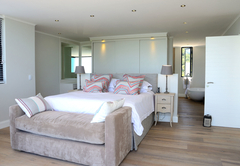 There are two further double bedrooms, both with en-suite shower rooms and queen size beds, plus an additional twin-bedded room (which can convert to a queen) with en-suite shower room and a large walk-on balcony. 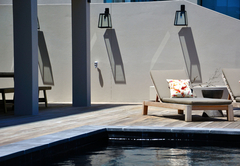 The two double rooms have shared access to a wide sun deck directly above the dining area and pool deck below. 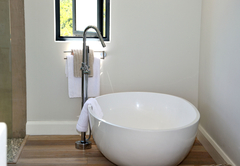 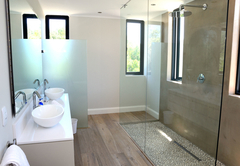 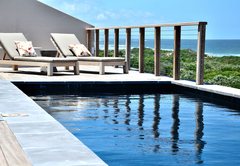 A large separate 5th bedroom is located below the pool deck and features an en-suite shower and bathroom. 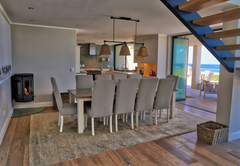 This suite is served by stacking doors that open onto a private deck that, in turn, leads to a private walkway to the beach. 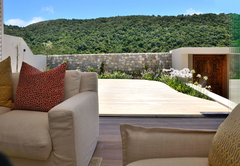 Outside there is a secluded walled courtyard to the front and a huge deck to the side and sea-facing aspect. 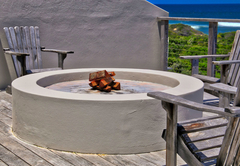 The sea-facing decked area boasts a round fire pit - perfect for intimate moments or group relaxation. 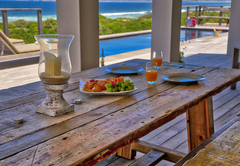 There is also a built in braai with a family size outdoor dining table. 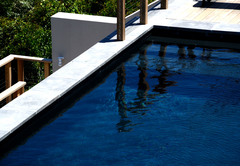 A well-proportioned family swimming pool and steps to the private walkway to the beach complete the picture. 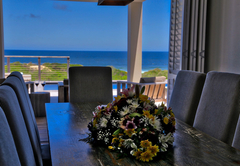 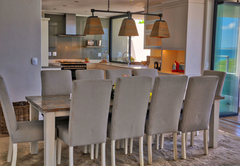 The owners of Beachscape are committed to environmental sustainability. 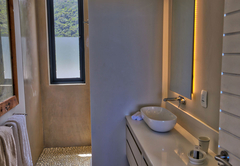 A rainwater storage facility and extensive use of solar energy for power and hot water are just some of the measures incorporated into this beautiful, state-of-the-art holiday home. 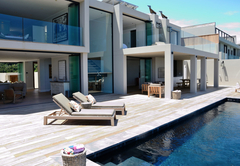 The highest possible rating is given to this house! 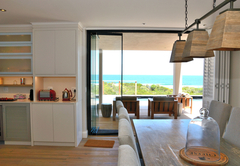 The house and décor are so beautiful, complemented by the full length foldable glass doors in each room facing the ocean. 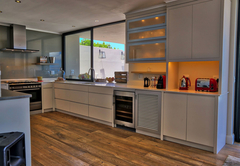 The house is enormous and can easily fit multiple families. 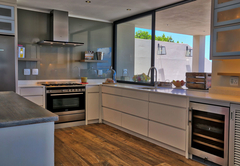 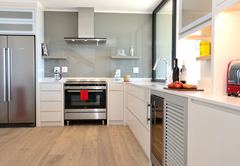 There were so many surprise features that added to our enjoyment of our stay - ice maker, wine fridge, two refrigerators, outdoor showers, yoga deck in the fynbos, boogies boards, beach toys, firepit, etc, etc. 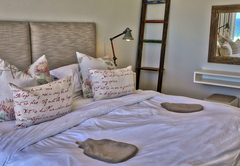 The location of Keurbooms is so perfect as it is outside the hustle and bustle of Plett but so close to access all the restaurants and activities, and just a short drive up into Tsitiskamma wineries, forest adventures, etc. 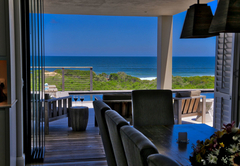 The beach in front of house is too beautiful and so private. 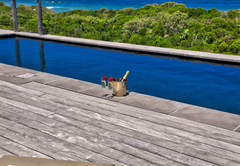 It is very short 1 minute walk down the lighted private wooden pathway from house to beach. 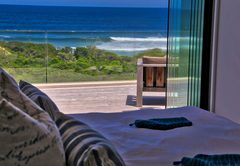 I cannot recommend this place enough, we will be back! 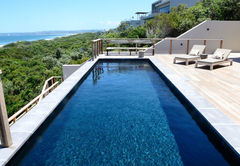 Amazing holiday! 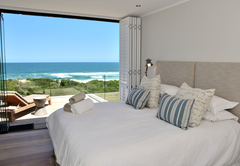 The accommodation was exceptional.